Chloë takes over Heidi’s ramp. I was meaning to write sooner, but I’ve been injured. For the second time in just three months, a bad wheel was slowing me down. The first time, when we were in Canada in August, it was my right front leg with a pulled muscle that made me limp. This time, it was muscle soreness in the back left. Some days this new injury didn’t seem to bother me at all, and I continued to leap into my camp chair, but the next day I would let out an unexpected yelp of pain just by leaping off a curb to the street. I had no problems going down a flight of stairs, but there was no way I was climbing back up, not even the two little steps in front of our house. Mike and Heather dragged Heidi’s ramp out of the garage just for me. The tread on the ramp needed a little mending, but I began using it on every trip up. Not down, just up. 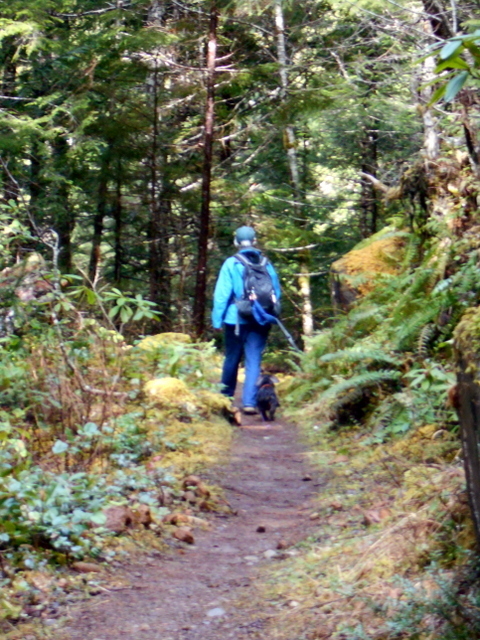 To prevent further damage to my leg, Heather put me on what she called “modified bed rest.” That meant when we went out to the Olympic Peninsula for Heather’s birthday, we didn’t go on any long, up-and-down hikes in the forest, like we usually do. This time I walked only on paved or flat trails like the Olympic Discovery Trail in Sequim. 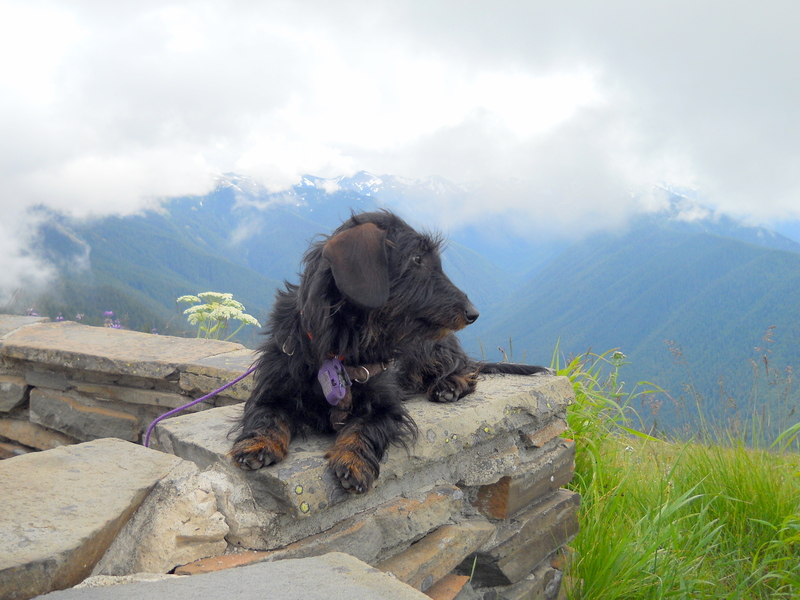 When Heather and Mike hiked to the top of Hurricane Hill in Olympic National Park, I stayed in the car. Fine with me, frankly. When we got back home, Heather didn’t make me stay in bed all day, but I was not allowed to play ball, not even inside with Wiffie. And I wasn’t allowed to run after squirrels or chase cats, either. Our afternoon walks were shorter, too. And with so much less exercise, I was getting crabbier every day, not to mention gaining weight. I feared the dreaded word “diet” might resurface when Mike came back from his trip east. This lingering physical malady started to change my personality as well. I got more standoffish and timid around other dogs. I started sleeping later, whining less, declining to get into bed and take a nap with Heather. I’d rather be alone in my beds in the office or living room. When Mike got back, I let him groom me without trying to get away. If I went downstairs with him to get a biscuit, I refused to go back up on my own. Eventually Heather would relent, come downstairs, pick me up and carry me up stairs, unsure whether my leg was still bothering me or if my reluctance to climb the stairs was all in my head. When I demanded similar service for the two steps up to her bed, she drew the line. Dammit. As long as she thought I was hurt, I planned to make the most of it, but apparently my jig is up. Heather put Heidi’s ramp back in the garage. The headline exaggerates, but only slightly. Here’s what happened. Heather, Mike and I were on our annual winter trek to the Olympic Peninsula, delayed a month or so this year because they visited Syracuse in February. Going out to the OP in March turned out fine, though, since the weather was milder and the days were longer. We had one stormy day when Heather and I napped all afternoon, but also enjoyed two beautiful afternoons of sunshine for hikes into the verdant Olympic National Forest. The sun’s rays revealed wisps of moisture rising from the nurse logs and the forest floor. 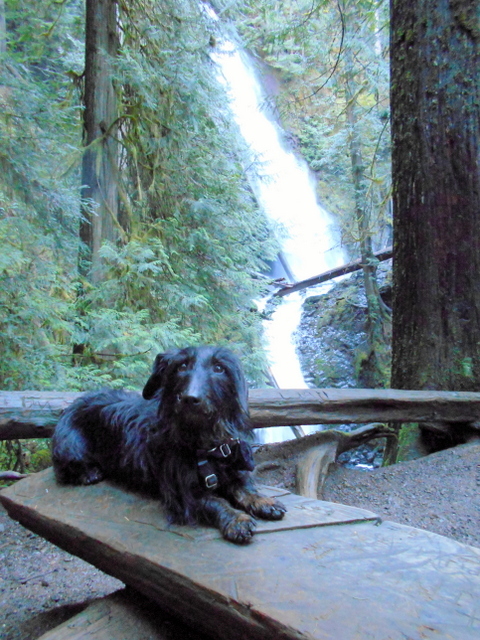 Our first hike, to Murhut Falls, was good, but I was disappointed that Mike decided the path to the base of the falls was too difficult to try. I didn’t agree, but nobody asked me. 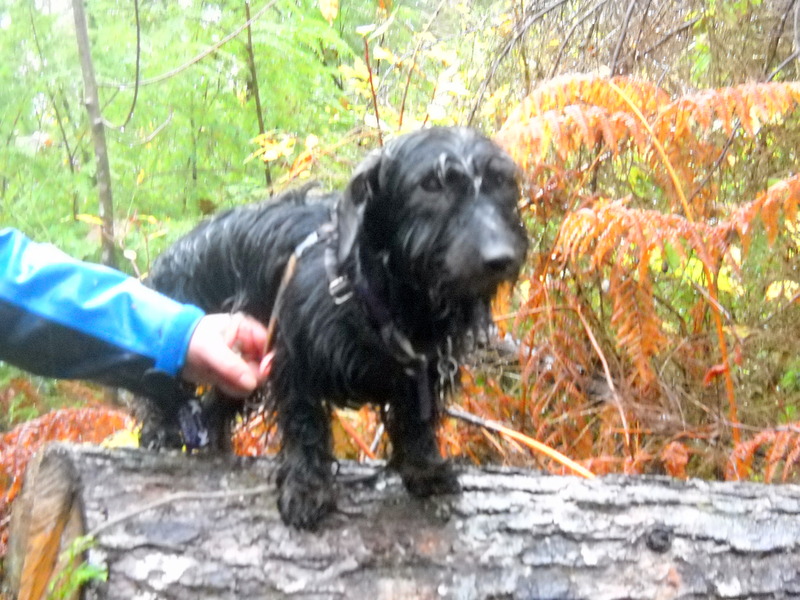 That’s probably why, on Monday’s hike along the Big Quilcene River, I didn’t pause to ask permission when chasing Heather’s errant throw of my purple-and-white ball off the trail and down the side of the embankment next to it. I knew Mike would try to prevent me from bounding down the cliff, a steep and dangerous drop to the roaring river a hundred feet below, so I ignored his yell and followed my ball, which caromed downward but luckily lodged against a fallen branch only about a dozen feet below trail level. Just as Heather started to slither down the bank in my direction for a rescue, I grabbed the ball in my mouth and plowed my way through the moss and underbrush toward the perplexed Mike, who was simultaneously angry and relieved. Mike made me give him the ball, which he stuffed it inside his pack emphatically. Heather said that it was she who was bad, not me. I wasn’t about to argue. At any rate, there would be no more ball playing on this hike, which took us almost three hours. We did get a break in the middle, when we climbed down to the river’s edge and I tried to do a little stream remediation, to no avail. The Big Quilcene won again. Oh, and when we got back to the car, I barked at a big German shepherd for no apparent reason. The dog might have attacked me, but seemed wimpier than I am. Once again, catastrophe averted. I lead a charmed life indeed. 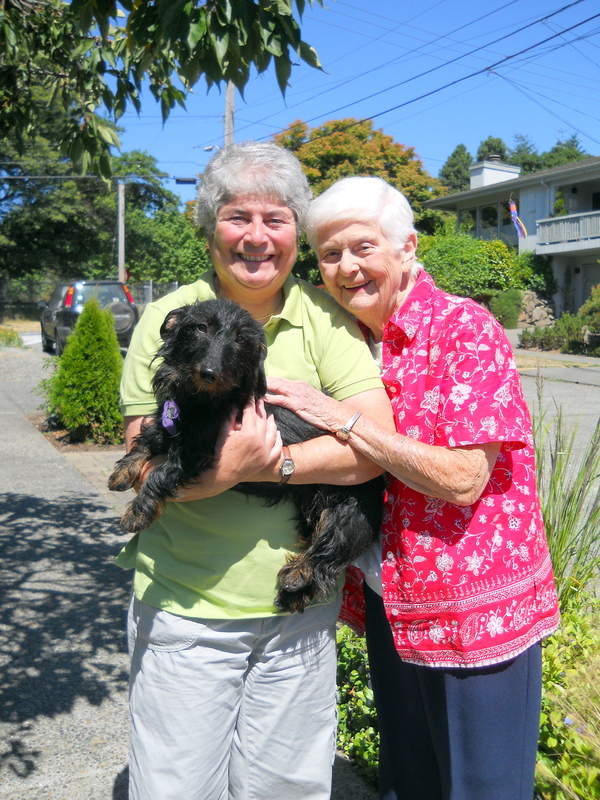 We went over to Port Townsend last weekend, but this time I didn’t have as much fun as in the past. Why? Let me count the ways. First of all, we didn’t go on the ferry, and I like the smells on the ferry. Instead, we drove around the Sound and over the Narrows Bridge, and both times we crossed it was raining so hard we could barely see anything. The rain didn’t stop. 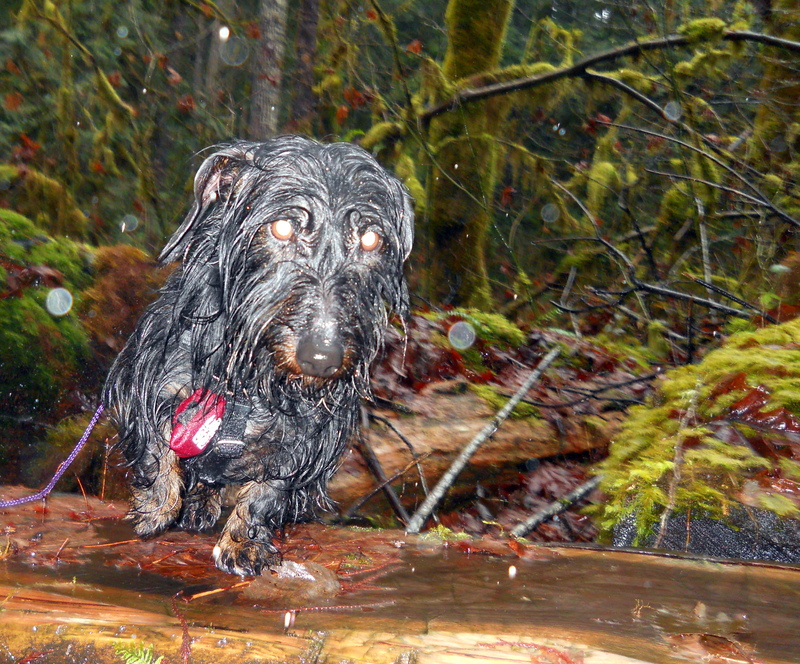 Then they made me hike in that rain. And they made me face the wrath of raging rivers. And worst of all, they made me sit in the back seat of the car, not in the lap of the person in the front passenger’s seat. What nerve! For spite, I refused to go to sleep back there. I just sat up and stared at Mike all the time we were driving. Every time he turned around, there I was, looking at him. 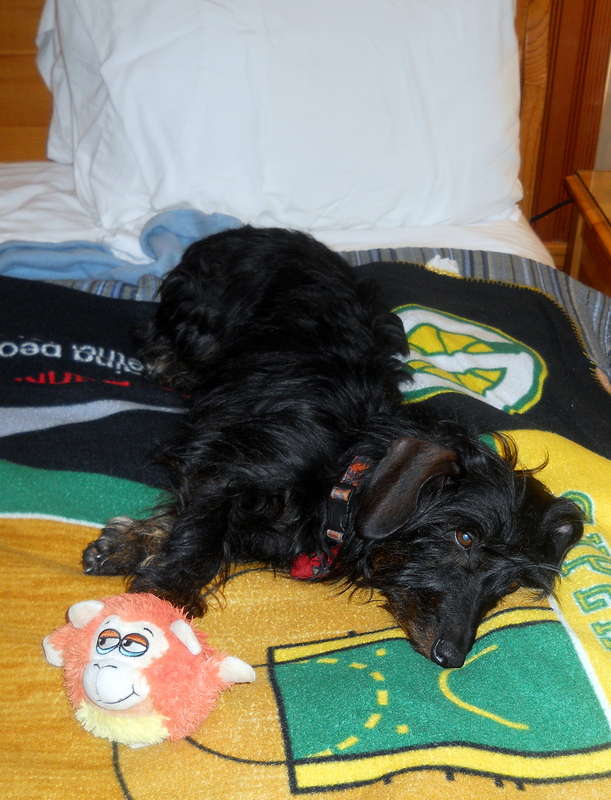 By the time we got to our hotel room, all that hiking and staying awake had made me dog-tired, so I had a nice nap with Hurby. Although Mike and Heather went to a couple of restaurants (making me wait in the car, of course), from my vantage point the snuggling I got in with Hurby and Heather was the highlight of the trip. No doubt about the low one: It was when Heather stopped short in the REI parking garage, and my head slammed into the dashboard of the car. It serves me right for sitting on Mike’s lap in the front seat, I guess. Regardless, come next February I’m going to lobby for going someplace other than Port Townsend. Arizona sounds much better to me. Warmer. Drier. I’ll even volunteer to sit in the back seat of the car the whole way. If anyone has been wondering where I’ve been for the past month or so, it was just around and about, for the most part. While Mike and Heather were promoting my blog on the East Coast, handing out my business cards like they were $3-off pizza coupons and getting me an orange Syracuse collar at Manny’s, I shared a “staycation” at home with my buddy Lynn . 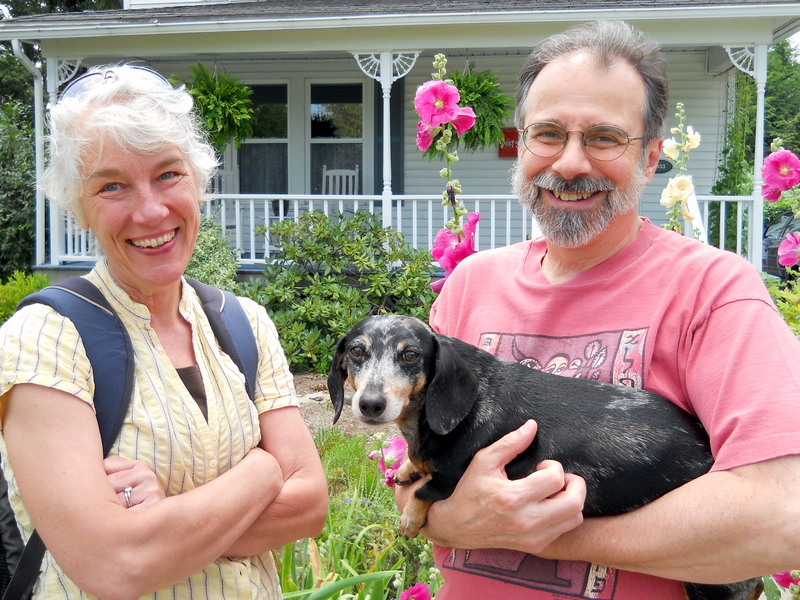 Heather visits my pals Gus and Kihm in Skaneateles, N.Y.
And not much happened here, to tell you the truth. Let’s see: The baby rabbits and raccoons got bigger. I met some new dogs. I missed the UPS guy. Mostly I was happy just lying around and sucking every tasty molecule out of the peanut butter-and-yogurt-crammed Kongs that came from the freezer. One night Lynn didn’t give me treats fast enough, and I showed my disapproval by ripping my young friend Halle’s portrait of me right off the wall of my crate. Everyone’s a critic, I guess. Halle’s supposed to be back from Montreal any day now, so maybe I can con her into drawing me another. Susie and Rosalie with Chloë. Almost as soon as Mike and Heather got home, Aunt Susie showed up. I remembered her scent right away! This time she came with Rosalie, Mike’s and Susie’s mom. Rosalie was very, very nice to me while she was here, so even though she is not among my regular readers (she’s so 20th Century! ), I let her pose with me for a personal photo, anyway. 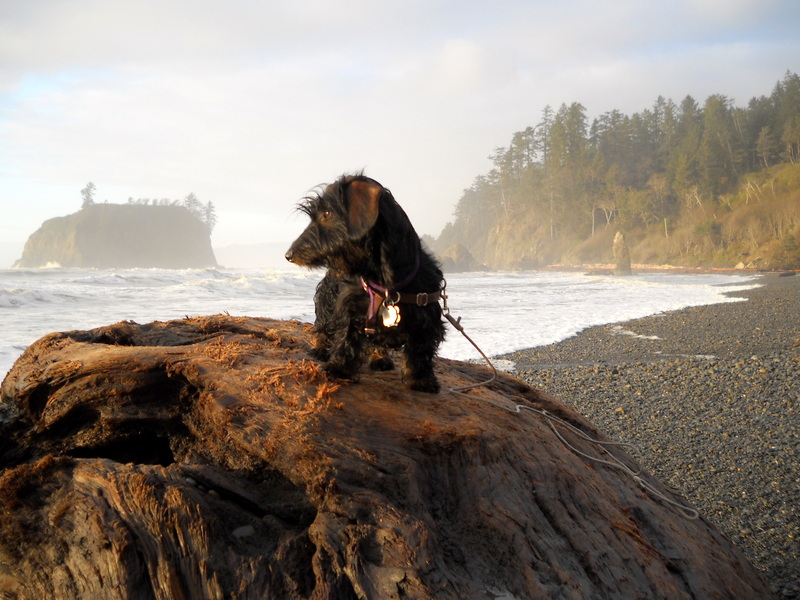 While she and Susie were here, we took another trip out to the Olympic Peninsula. I got to walk all around the ferry with Heather and logged many miles along the Olympic Discovery Trail. 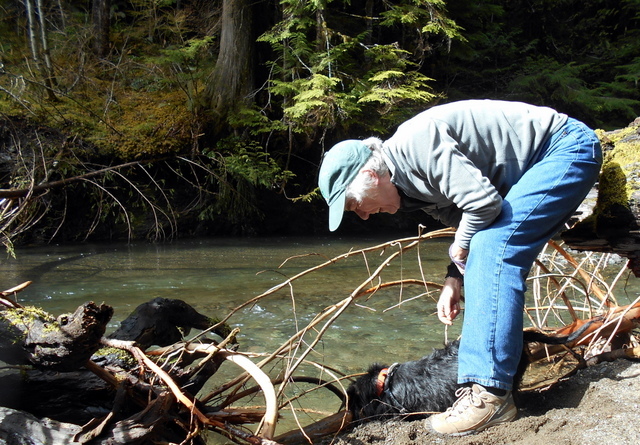 Not a lot of wildlife to track, but it’s good exercise and senior-friendly. Hurricane Ridge was neat, even though I had to hang around the parking lot and visitors’ center. At least I got to go along this time . And I even brought home a nice souvenir: A large marrow bone from Mike’s pork osso buco at the Dupuis Restaurant between Sequim and Port Angeles. I was glad to see Mike and Heather when they got back, and I had a great time with Susie and Rosalie, but the afterglow can only last so long. Since it had been almost a month since my last toot, I decided to welcome Mike back taking off on him in the park. Instead of chasing my ball, my nose jerked around and I was sprinting into the woods on the trail some small burrowing mammal, maybe a rat or a mountain beaver. I heard Mike yelling, trying to lure me back with promises of treats, but I was having more fun ignoring him. I found the hole into which the animal had vanished, and I plopped myself down, deep within the blackberry and stinging nettle, making hardly a sound or a rustle in the leaves, disregarding all Mike’s whistles and calls, digging. Concerned about my silence and the impending darkness, Mike called Heather on his cell phone to come down with tools and gloves. Then he decided to slog in on his own and haul me out by the harness. Good thing, too, or I might have been there all night. Today I’m back outside in my exercise pen, watching the painters go in and out of the house next door and guarding the block against dogs and strangers with fervent barking and tail-wagging. Yes, vacation’s over, and things seem to be getting back to normal. Before a couple of weeks ago, I had only seen it in maps and photographs, but Mike and Heather are always yapping about it: the Olympic Pensinsula (the OP to locals). Mike and Heather really like it out there on the OP. 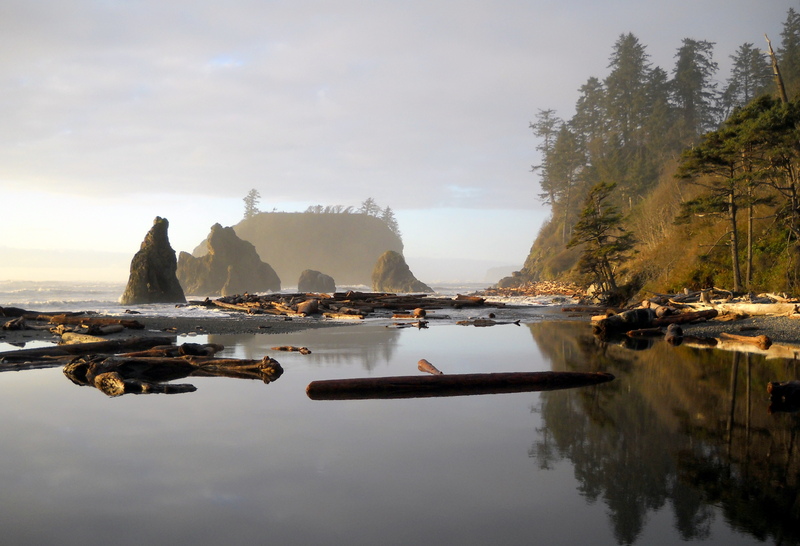 Ruby Beach at high tide. Their friends Kihm and Laurie were visiting from Skaneateles, N.Y. Kihm has just published the book Skaneateles, the Character and the Characters of a Lakeside Village (in fact, Mike has been reading excerpts to me every night before bedtime, and I heartily recommend it; you can order it online from the Skaneateles Historical Society website). 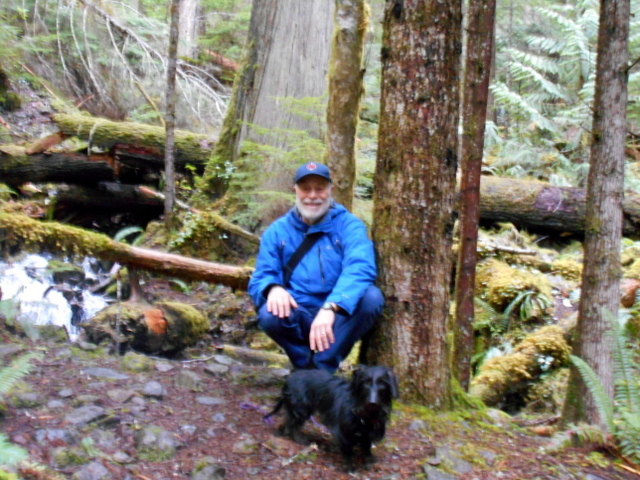 Kihm and Laurie’s visit prompted this brief November excursion to the Pacific Coast and the rain forest around Lake Quinault. Kihm and Laurie didn’t mind that I was coming along, since they, too, are dachshund owners, of an apparently pushy little guy named Gus. Compared to what I heard them say about Gus, my behavior is already exemplary, which I will be mentioning frequently in my future dealings with Mike and Heather. But I digress. The first destination on our trip was Ruby Beach, which was really pebbly, with huge trunks of driftwood and many sea stacks, large rock formations rising from the ocean. Heather and I were attacked by a rogue log that washed in with the high tide, and she had the bruises to prove it. Not to mention wet feet and jeans. I emerged unscathed, of course, and ready to resume chasing the surf and the passing gulls. The next beach , where we stopped to watch the sunset, wasn’t nearly as scary. It was wide and flat, and I could run way out towards the water to chase the gulls without danger. Too bad it was getting dark, because I really would have preferred to stayed longer. Mike and Heather told me we had a lakeview room at the Lake Quinault Lodge that night, but you wouldn’t know that by me. It was dark when we got there and dark when we left. Mostly I saw the inside of my canvas crate, and I was more than happy to be in it. This OP hiking takes a lot out of you. Next morning they went to breakfast, and unbelievably, Mike did not bring me back even a tinsy taste of the lodge dining room’s legendary sweet potato pancakes with maple syrup and hazelnut butter. Not one damn plate to lick. Who called this a vacation? Not for everyone, apparently. 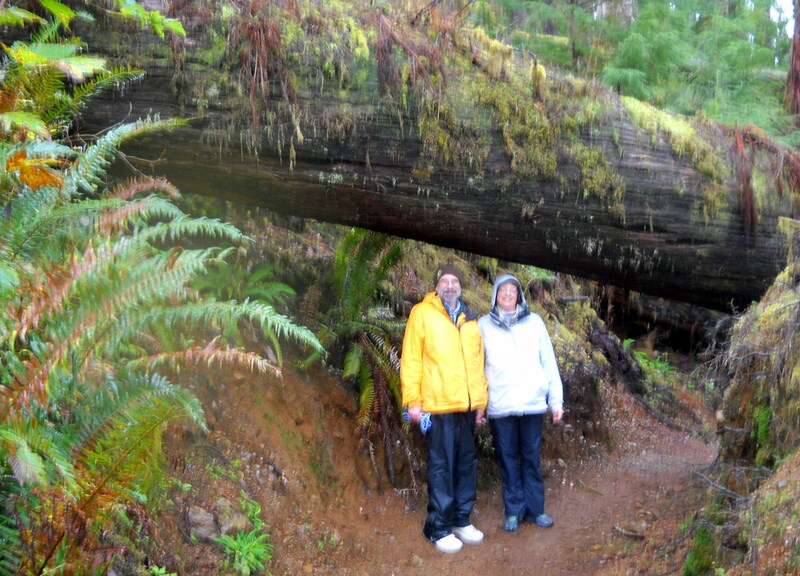 Kihm and Laurie in the rain forest. I had even stronger doubts about this whole “vacation” thing some 3 hours later, as we were ending our little jaunt through the rain forest that surrounds the lodge. 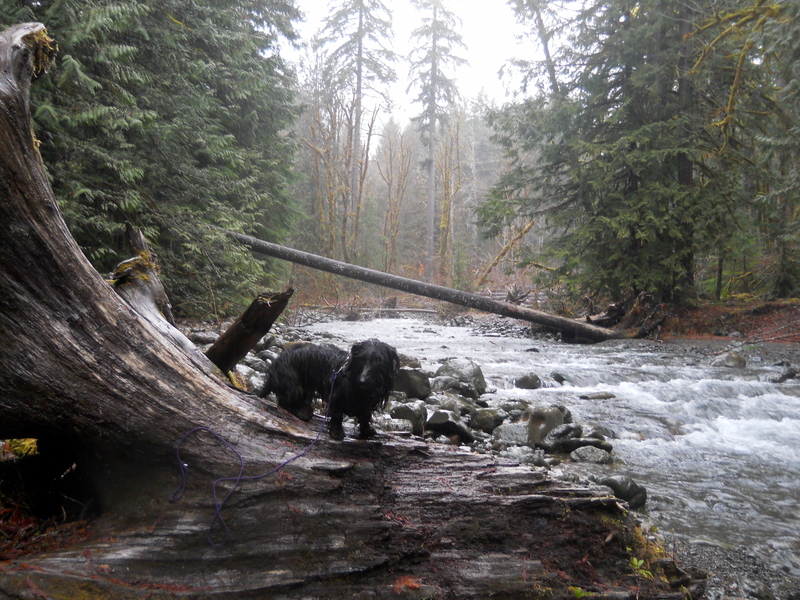 The hike was great at first–lots of great new stuff to smell, waterfalls, neat bridges, stuff like that–but then it started to rain. And then it rained harder. And harder. On the OP? Nobody mentioned this part. Chloë at the end of her rain forest hike. Next time, let’s try Eastern Washington. It’s supposed to be drier there. But in most ways, I liked traveling, and I’m already looking forward to my next trip. Taking my first with Laurie and Kihm was such fun that I urge everyone to buy his book, so they can afford to visit me again soon.